Operations for varicose veins are still widely performed in many countries. Many surgeons consider the long-term results of surgical procedures to be the best. The chronic nature of the underlying disease, however, means that recurrences occur time and again after surgery, as with all other methods of treatment. Around 300,000 varicose vein operations with subsequent hospital stay are performed in German hospitals each year, despite patients’ ever-increasing demands for minimally invasive procedures without a general anaesthetic or incisions. In other countries, modern endovenous therapy has overtaken surgery for a long time, as these new procedures give similar results, but are considerably less invasive and patients are fit again much sooner. In addition, scar formation after standard surgical procedures can be very burdensome for the patient. The classic surgical procedure to remove trunk varicose veins – crossectomy in combination with stripping – was described in 1907 and the slightly modified technique of vein ligation and stripping is still in use today. The patient is given either a general or local anaesthetic before the surgeon makes an incision into the skin close to the point where the trunk varicose vein empties into the deep vein system, ties off the vein, and then cuts it off (crossectomy or high saphenofemoral ligation). A metal wire is pushed down through the diseased trunk vein and brought out through the skin via another incision in the thigh or lower leg. The wire is pulled out, bringing the varicose vein with it (stripping). One positive development is that many surgeons now make every effort to remove only the diseased portion of the trunk vein and no longer perform radical operations. Side branch varicose veins can be treated with sclerotherapy or removed with tiny hooks, a procedure known as hook phlebectomy. Multiple small incisions are needed to catch the diseased veins with the hook and pull them out through the skin. Phlebectomy usually causes only slight restriction of everyday activities after the procedure. After stripping, patients often have to stay in hospital for 2-3 days and are off work for at least 1-2 weeks. This period after treatment is usually associated with pain, haematomas, and no sporting activities for a longer time. Compression stockings or bandages have to be worn for a few weeks to reduce postoperative problems. The aim of surgical procedures is to remove the diseased vein or at least that part of it, which is disrupting the blood flow, and redirect the blood through healthy veins. Trunk varicose veins are removed by first of all separating them from their junctions with the deep vein system and then pulling them out. With phlebectomy procedures, segments of the varicose veins are exposed through multiple skin incisions and each part is then pulled out until the diseased vein is finally removed in its entirety. As existing connections to other or smaller veins are ripped out at the same time, haematoma formation is quite common. With time, the vein stumps close and the blood seeks a new path. In the hands of an experienced surgeon, surgery for varicose veins is very effective. Once the bruising and swelling have disappeared and the wound has healed, the varicose veins have been removed and the blood flow returns to normal. Nonetheless, this chronically progressive disease means that new varicose veins may appear in areas already treated. Data on the incidence of recurrence vary greatly. Advocates of surgical methods consider that the long-term results of surgical procedures are better than those of any other type of treatment. Recent analyses and guidelines, however, show that the alternative procedures are similarly effective and safe. The recently issued NICE guideline recommends stripping operations only when endovenous procedures – laser therapy, radiofrequency ablation, and foam sclerotherapy – are not possible. This represents a paradigm shift, as experts estimate that some 80-90% of trunk varicose veins worldwide are still treated surgically – although this is no longer recommended by this current guideline. In some cases, an operation cannot be avoided and surgical procedures obviously still have a place in the treatment of varicose veins. Unlike in the past, the approach today is no longer the routine removal of the entire vein, but rather removal of only the diseased segments. The alternative methods of treatment – which are less invasive and less painful, while still achieving the same results – are becoming more and more popular with patients and doctors alike. In the end, after performing a thorough examination, only the doctor can say which treatment would be the most appropriate for you. When are surgical procedures not possible? if you have an acute inflammation of the veins (phlebitis). if you have a deep vein thrombosis or pulmonary embolism. if you have acute bleeding from your varicose veins. if you are on warfarin or other anticoagulants (blood thinning medicines); the medication must be stopped before surgery if possible. if you have severe peripheral arterial occlusive disease (a disorder of the arterial circulation in the legs). if you are allergic to the anaesthetic agent to be used. if you have an acute infection or inflammation at the site of the operation. Special care should be taken if you currently have a serious medical condition, an acute infection, or a high risk of thrombosis. This could be, for example, an inherited tendency to thrombosis (thrombophilia) or if you have to lie in bed with a plaster cast for a long time after an injury. Your surgeon will discuss any other illnesses that may have to be considered. If there is any possibility that you could be pregnant at the present time, you must tell your doctor about this without fail before starting treatment. A thorough examination and diagnosis are needed to select the correct therapy and for the success of treatment. They are therefore essential before any operation is performed. The surgeon will explain how the operation will be performed and discuss the possible risks and chances of success. Explanation of the anaesthetic procedure and its associated risks. Preoperative investigations to determine your general health and ability to undergo surgery/have an anaesthetic (blood tests, ECG, etc.). If you are taking warfarin or other anticoagulants, these are generally stopped some time before surgery or you will be switched to alternative treatment. Your doctor will decide what is best for you. A decision will be taken about thrombosis prophylaxis; with a moderate thrombosis risk, heparin or low molecular weight heparin is usually injected for 2-4 days. Compression stockings will be prescribed if compression bandages are not going to be applied. Admission to hospital, if necessary. Discussion about sick leave: as a rule, you will be off work for 1-2 weeks, but it may be longer depending on occupation. Information about the day of operation (how long you cannot have anything to eat or drink before the operation). Stripping is usually performed in a hospital, more minor operations can be carried out on an outpatient (ambulatory) basis. Generally, for an ambulatory procedure to be considered, the varicose veins must not be too pronounced, the patient must not have any serious illnesses, and there must be someone at home to keep an eye on the patient immediately after the Operation. The operation itself is not painful, as it is always done under some form of anaesthesia. When the effects of the anaesthetic wear off, painkillers (analgesics) are prescribed to combat any pain. 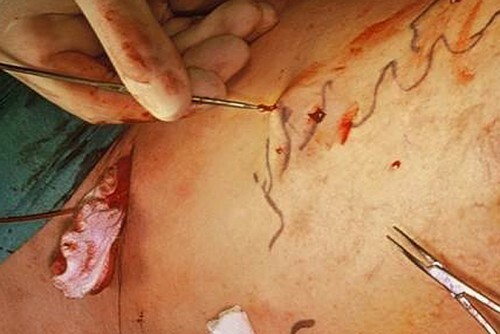 Surgical removal of side branch veins is usually done under local anaesthesia: the skin and subcutaneous tissues over the vein have to be numbed at each and every site of incision. Stripping, on the other hand, is done under a general anaesthetic or, in some cases, with tumescent anaesthesia. Stripping is usually combined with the division of (the trunk veins and) other veins in the groin – for which the technical term is a high saphenofemoral ligation or crossectomy. The combined procedures are commonly referred to as ‘ligation and stripping’. Depending on whether the trunk vein concerned is the great saphenous vein (vena saphena magna) or the small saphenous vein (vena saphena parva), an incision to expose the vein is made in the groin or the hollow of the knee. All the tributary (side branch) veins emptying into the vein at this junction are carefully tied off (ligated) and divided. The trunk vein is then also tied off and divided at the point where it empties into the deep vein of the leg. This procedure is known as crossectomy or ligation (saphenofemoral ligation in the groin or saphenopopliteal ligation at the knee). Stripping follows the vein ligation. A metal wire is pushed down through the cut end of the trunk vein to the end of the diseased vein and is then brought out through the skin via another incision in the thigh or lower leg. The lower end of the diseased vein is fixed to the wire and then the wire is pulled out, bringing the varicose vein with it. During this procedure, any smaller veins emptying into the trunk vein are ripped off. The incision in the groin or knee is closed with sutures and any other smaller incisions taped together with adhesive strips. The stitches are usually taken out 10-14 days after the operation; the wound must be kept completely dry in the meantime. A wound and compression bandage is then generally applied, which should be worn for a few days. After this, compression stockings or a compression bandage must be worn for 4-6 weeks. The whole operation, including the anaesthetic, lasts anything from 1-3 hours, depending on the extent of the varicose veins. You will probably have to stay in hospital for 2-3 days after surgery and will be off work for 1-2 weeks afterwards. If varicose disease recurs in the same place and further surgery is necessary, the second operation is technically more difficult and associated with considerably more complications. This procedure is usually done under local anaesthesia, injecting the local anaesthetic along the length of the varicose vein. The procedure is also called hook phlebectomy. 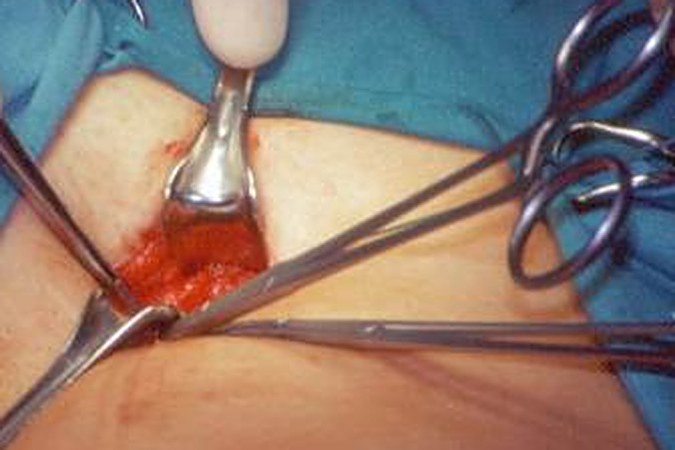 A hook is inserted through a small skin incision into the subcutaneous tissue. The diseased vein is caught with the hook, pulled out through the skin, and ripped off. Another incision is made; the hook is reinserted and the next segment of the vein ripped out, and so on. In this way, it is possible to remove large segments of vein through several small incisions. The incisions usually heal without scarring. Phlebectomy is often performed as an outpatient (ambulatory) procedure and leads to only minor restrictions in everyday life and at work following the operation. After-treatments of varying complexity and several follow-up examinations are always necessary after surgical procedures. As a rule, heparin or similar injections are given as thrombosis prophylaxis for 2-4 days, or longer in high-risk patients. Patients are usually off work for 1-2 weeks. With purely sedentary occupations or jobs that involve standing all day, sick leave may be extended to a month. Painkillers (analgesics) are usually required. The stitches and adhesive wound strips have to be removed about 10-14 days after the operation. Wounds must be kept completely dry in the meantime. In the first 2 weeks after the operation, avoid sitting or standing for long periods; it is best not to sit or stand for more than an hour a day. Go for a 20- to 30-minute walk several times a day. Walking around and lying with your legs elevated are necessary to boost the circulation in the legs and to prevent thrombosis developing. Wear compression stockings or bandages until all symptoms have resolved or for as long as your surgeon tells you to do so (4-6 weeks). Do not recommence even light sporting activities until 14 days after surgery. You are advised not to participate in any strenuous sporting activities for at least 4 weeks after treatment. Avoid the sauna, long hot baths or showers, solaria, or prolonged sunbathing for a few weeks after the operation. It is difficult to give a precise length of time, so you should rely on the experience and recommendations of your doctor. Do not plan any long journeys by bus, train, or car in the first few weeks after the operation and, in particular, avoid long-haul flights. Contact your doctor without delay if you notice anything untoward or the leg is very painful. Please be sure to attend the follow-up examinations. As with any medical procedure, complications may arise after varicose vein surgery, even when the operation is carried out absolutely correctly. Bleeding, damage to large blood vessels, and anaesthetic incidents may occur during the operation. Systemic allergies to the anaesthetic agent may rarely occur. The risk of nerve injury, with a resultant disorder of sensation or movement, increases the nearer the operation site is to the foot. Bruising and haematomas, swelling, and postoperative pain are common and are treated with painkillers (analgesics). Bleeding after the operation, delays in wound healing, and infected wounds are more common than with thermal procedures, as the skin incisions are larger and there are more of them. Scars form to different extents. The skin may become discoloured around the area of the treated veins, but this change usually resolves soon after treatment. In rare cases, deep vein thrombosis may occur. Deep vein thrombosis is not specific to any particular surgical procedure, but rather reflects the increased tendency to thrombosis associated with all operations. Before you have surgical treatment, your surgeon will explain the possible side effects and answer any questions that you may have.